When I find time on my hands, or if I’m in the car on a long drive headed out to look at property, I’ll often listen to podcasts. It’s a great way to pass the time and feel like I’m either getting smarter, more productive, or relaxing, which can be just as important for one’s success as learning new things. 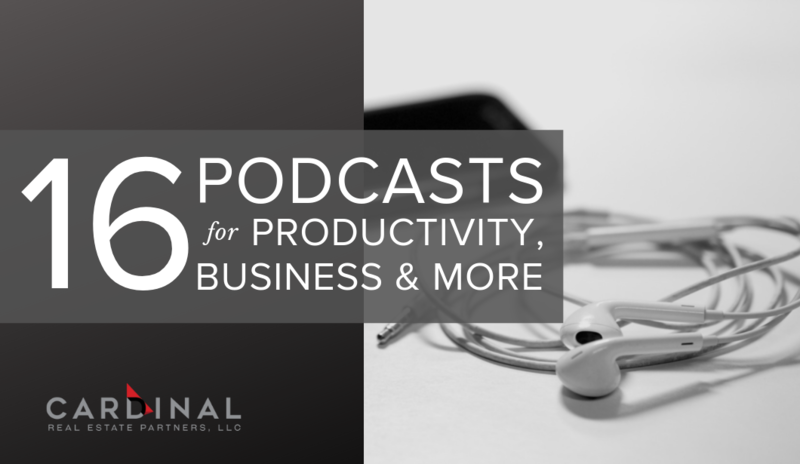 Here are my favorite podcasts for fun and personal growth. They cover a mix of topics. What do you listen to? I’m always looking for new suggestions. Details: CyclingTips is a podcast that seeks to share the beauty of cycling and to inspire cyclists of all levels to become better and more knowledgeable riders. Details: The Team Success Podcasts are a series of insights around teamwork and success that she’s gained from working with entrepreneurs. Details: Blinkist believes in big ideas. This is the place where you can hear them. Details: The biggest stories of our time, told by the best journalists in the world. Details: Inside Strategic Coach is a practical resource for entrepreneurs, or anyone with a growth mindset. The hosts share breakthrough insights, educational success stories, and insider know-how, gained from working with thousands of successful business owners, worldwide. Details: this podcast is for Entrepreneurs, small business owners or even start-ups that want inspiration and ACTIONABLE marketing strategies about direct mail ideas, lead generation, lead conversion, getting referrals, email marketing and more. Details: Listen to highlights and extended interviews in the “Ears Edition” of The Daily Show with Trevor Noah. From Comedy Central’s Podcast Network. Details: Institutional Real Estate, Inc. (IREI) — a commercial real estate publishing and consulting company — presents our new, free podcast series to help keep you up-to-date on the current institutional real estate investment market. Details: The Inside Real Estate Show with Darin Persinger, takes you inside the real estate industry. Showing home buyers and home sellers what matters, and how you can get started with real estate investing. Details: If you’re looking for strategies to become more efficient—to have more time and freedom to do the things you love—this is the podcast for you. Details: Revisionist History is Malcolm Gladwell’s journey through the overlooked and the misunderstood. Every episode re-examines something from the past—an event, a person, an idea, even a song—and asks whether we got it right the first time. Details: The Audible Originals series Presidents Are People Too! recasts each of the American Presidents as real-life people, complete with flaws, quirks, triumphs, scandals and bodily ailments. Details: Join meditation coach, Mary Meckley, for daily meditation inspiration as she answers your questions and guides you on the journey of establishing a daily meditation ritual. Each week you’re introduced to a brand new meditation theme to keep your meditations dynamic. Details: 10xTalk delivers 10x Multipliers To Grow Your Business hosted by Joe Polish, founder of GeniusNetwork.com and Dan Sullivan, founder of StrategicCoach.com. 10x Multipliers To Grow Your Business. Insights For An Ever Expanding System Of Increasing Cooperation & Creativity Among Unique Ability Achievers.